Smoke in Southwest Colorado is coming from the Assayii Lake Fire north-northwest of Gallup, New Mexico. The growing fire Monday necessitated the evacuation of two rural communities. The fire, on the Navajo Nation about 100 miles southwest of Durango, ballooned to more than 17 square miles, forcing Navajo Nation police to issue an evacuation order for parts of Naschitti and nearby Sheep Springs. About 400 people live in the area, and fire managers said those who have yet to leave have been put on notice that more evacuations could be possible. Evacuees were being put up for the night at the high school gymnasium in Tohatchi. The fire started Friday, according to a news release Monday morning from Durango Interagency Fire Dispatch. Several hundred firefighters were on scene, as were a number of aircraft. The fire is burning in stands of mixed conifers. A dispatcher at the Flagstaff (Arizona) Fire Dispatch Center said the cause of the fire is being investigated. A Type 2 response team reached the fire early Monday, he said. Current weather conditions likely will bring smoke from the fire toward Southwest Colorado for the next several days. 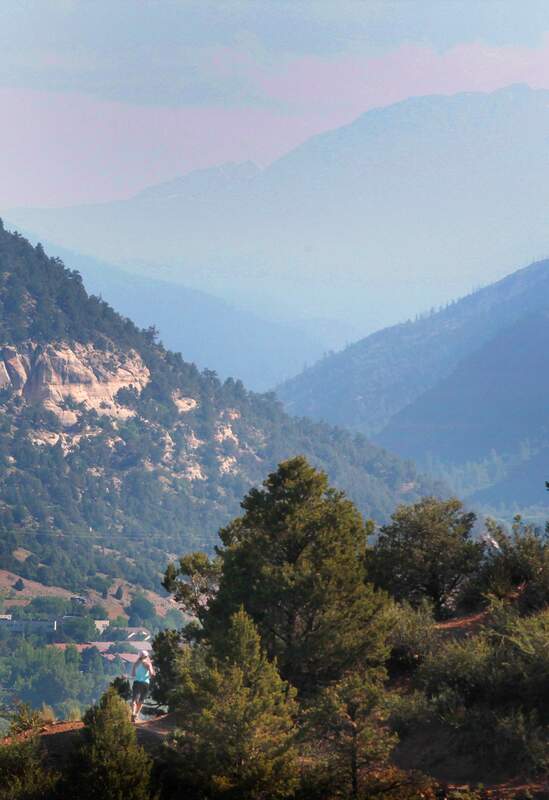 Smoke has lowered visibility in Durango, the Animas Valley and at Navajo Lake, according to various reports. A red-flag warning is in effect for Southwest Colorado through Tuesday. A red-flag warning, according to the National Weather Service, requires a combination of conditions: dry fuel, winds of more than 25 mph and relative humidity of less than 15 percent. 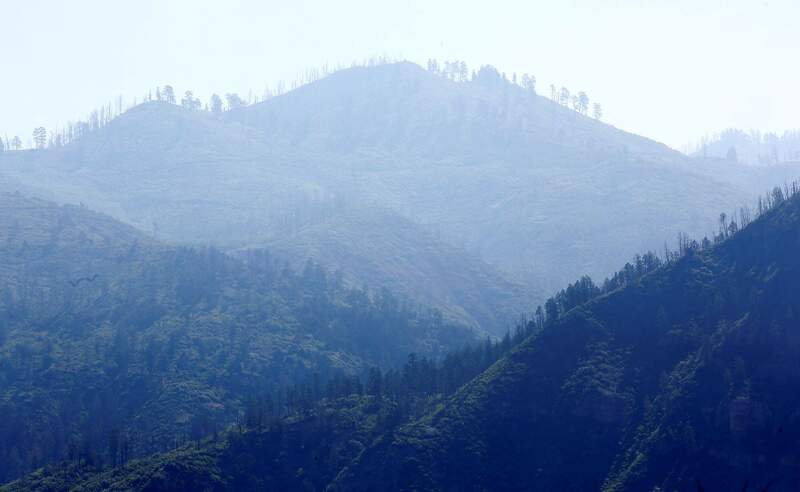 Butch Knowlton, director of emergency services for La Plata County, said Monday that all agencies involved in fire prevention and suppression are monitoring conditions. Stage 1 restrictions would include placing limits on outdoor burning, Knowlton said. The Durango dispatch center has responded to 44 small fires since the season began and five this week. The Assayii Lake Fire was burning about 6 miles from Naschitti, a rural community whose residents live in homes scattered throughout the hills surrounding the tribal chapter house. Tribal police were working to notify residents, while area radio stations issued alerts and chapter employees spread word of the approaching fire through social media. “We’re at the first stage of letting the community members know,” said Carol Edison, who was manning the phones at the chapter house. Edison said the wind was howling, and the plume of smoke was hanging right above the community. Authorities also were warning ranchers and others to stay out of the area because the fire’s behavior was so erratic. They said treetops have been torching, and spotting has been reported ahead of the blaze. Because of the unfavorable weather, crews were scouting the area for locations where they could build fire lines without being in the direct path of the flames. 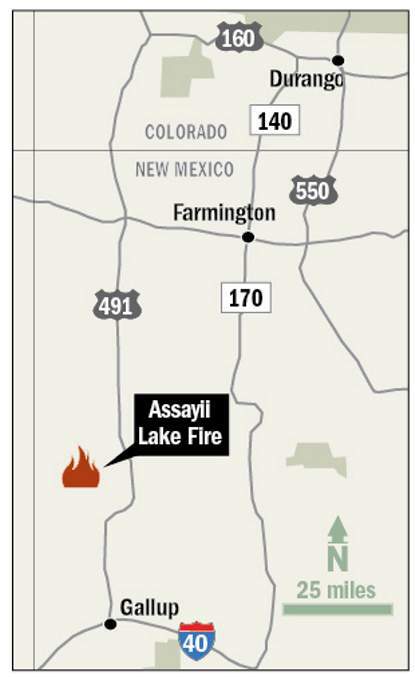 The Assayii Lake Fire was believed to be human-caused, but authorities said the investigation is ongoing. daler@durangoherald.com. The Associated Press contributed to this report. With the mountains north of Durango nearly obscured Monday, a trail runner clears the top of a hill near Fort Lewis College. Smoke is from a wildfire north-northwest of Gallup, New Mexico. Smoke from a fire northwest of Gallup, New Mexico, fills the Animas Valley on Monday.